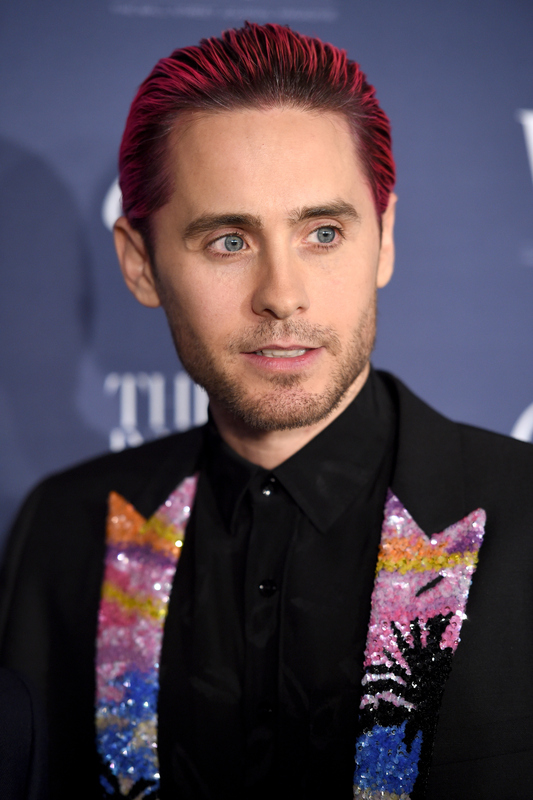 Taking the art of DGAF to a whole new level, Jared Leto wore sequined, palm tree print lapels to the Wall Street Journal Magazine Innovator Awards, a prestigious and well-attended event held at NYC's Museum of Modern Art, and he was a masterpiece to behold. Did I mention that he recently colored his hair pink, and that upon closer inspection it appears that the black button-down he wore was not a simple black button-down, but a black-on-black tropical shirt? Did I mention that those who posed next to Leto on the red carpet appeared to wear expressions of barely contained bemusement? Did I mention that Leto is the only man I think to check out on the red carpet, since so many famous dudes wear the same black and white suit on the red carpet as if it would actually kill them to break out something else? In a world where men's fashion is so hostile toward experimentation that a news anchor can wear the same suit every day for a year and have nobody notice, Leto's quirky personal style draws criticism like I'm drawn to red lipstick — he was once named GQ's Worst Dressed Man in the World and routinely lands on other worst dressed lists. However, are Leto's choices really so outlandish when compared to women known for their boundary-pushing personal style, such as Lady Gaga, who, let's not forget wore a dress made of meat? In comparison, Leto's sequined lapel seems downright tame. While I'm glad to see Leto pushing the boundaries of men's fashion, here's hoping that some day it won't be an uncommon occurrence for men to wear skirts or rock the latest hair color fad if that's what they want to do. Until then, let's all take minute to appreciate the craziest of Leto's red carpet looks. Leto wore this beauty to the 2015 Oscars. The color looks great on him, and I'm digging his ombre hair and beard. It evokes cowboy and '20s gangster! Am I the only one wishing man skirts would go mainstream? While I mourned when Leto cut off his magnificent flowing locks earlier this year, I'm digging his Billy Idol look here. Is anything more American than a jean jacket and the still-warm skin of your fresh kill hanging over your shoulders? No. No, there isn't. This is the closest to real life anime hair I have ever seen a human being achieve without the aid of a wig. Is he a grandpa or a hipster? Is there really much of a difference? Here's to Leto! Let's hope for more awesome outfits in the future. Want more fashion? Check out the video below, and be sure to subscribe to Bustle’s YouTube page for more hacks and tricks!